Anytime a comic book publisher offers a "big event" for their line, it's usually an unnecessary multi-title crossover storyline. A reboot that forces the reader to start over with new #1 issues and a new directive. In DC Comics' case, a revamp was needed after 'New 52' failed to ignite sales and fans. Some good books emerged but it was clear the majority were not resonating. As part of Geoff Johns' mission to bring "hope and optimism" to comics and films, 'DC Universe Rebirth' is the first step that's part confession, part mission statement and overall works well. The DC universe is broken according to the narrator, Wally West, as he tries to reconnect with someone out of the speed force. He paints a grim picture, basically describing the atmosphere of the 'New 52' where characters were stripped of their identities, others removed altogether, and the tonal shift to darker storytelling. It's a mea culpa delivered through Wally's exposition that sets the table for a return to what made DC heroes great to begin with. There is a heartfelt reunion and a trip around the DC universe checking on characters that until now were missing in action. It's a great Easter Egg hunt rewarding the fans for taking this trip to hopefully brighter days. The end is genuinely shocking and necessary. It lays out the new directive going forward that should make fans happy. In Johns own words,"It brings back what has been lost, the legacy of the characters, the love and the hope of the DCU!" There's a who's who of top artists on this extended length book including Gary Frank, Ivan Reis, Ethan Van Sciver, Phil Jimenez, and more. 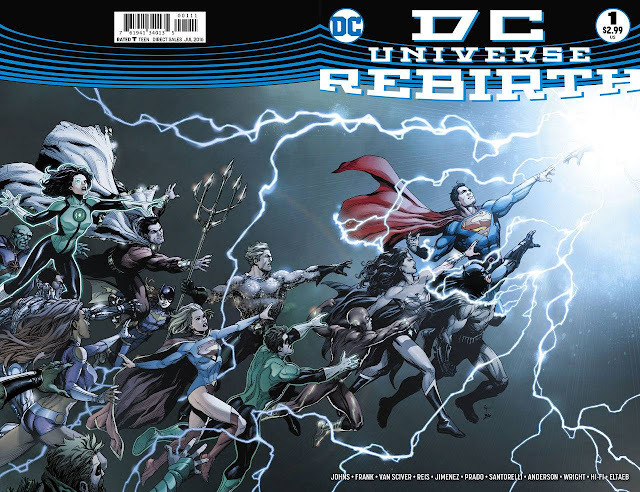 They all bring their best work making 'DC Universe Rebirth' a stunning page-turner. At the very least, DC acknowledges there's a problem with the current tone of their books. The sales charts tell a grim story, continually coming in second to Marvel. This is an attempt to do a course-correction that hopefully ushers in a more successful era than the 'New 52' did. 'DCYou' was honorable but half-baked and not well supported. 'Rebirth' is off to a good start and will be judged on the books that follow. We've got our fingers crossed.